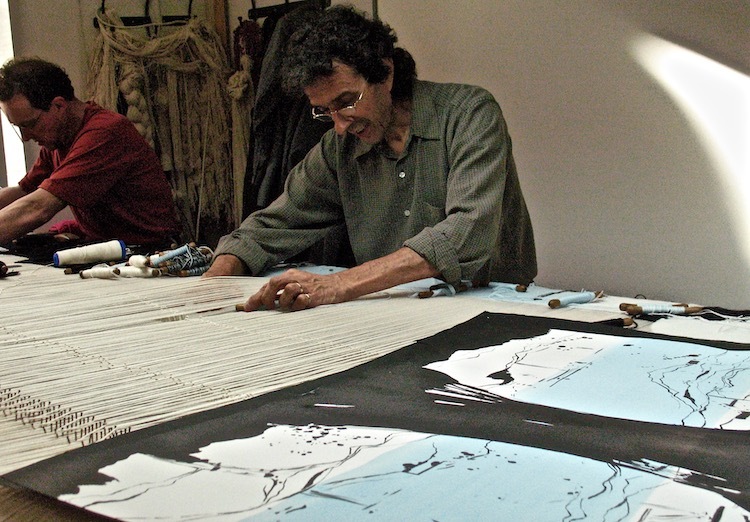 The works of the tapestry artist Marcel Marois are like palimpsests. In the thickness of the stitches, each strata covers up another, as if deep layers of memory were trying to make their way back to the surface. History — including art history and the history of textile itself — fades and reappears, blurring the various readings of its narratives. Nature, the precarious bearer of social reality, serves as a guiding thread. The artist has been exploring it since the 1970s through the various upheavals in its history and its systems of representation. In this regard, all traces of the naturalist figuration that appeared in the interval between the abstract works Mephisto (1972-1973) and Wind Territory (2010-2014) have been gradually erased, reinforcing the idea of loss. The works in this online exhibition are grouped specifically around issues associated with memory, with temporal and aesthetic rifts and various modes of image production. The distinctiveness of Marois’ art undoubtedly resides in the manner in which he redefines his discipline from the inside, faithfully reconnecting with the tradition of tapestry and skilfully reconciling past, present and future. 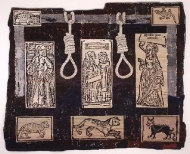 Thus, while adhering to the techniques employed in the seventeenth-century Gobelins tapestry factory, he brings into play references to the tapestry of the Renaissance and (especially) of the Middle Ages. He accomplished this by placing text around the borders of the support, incorporating frames into the weave of the image and using geometric stylization, walled-off horizons, allegorical fictions, and references to bestiaries and nature. While narration remains a major component of this age-old discipline, Marois has it serve as a pretext for the revision of his own referents, exploring perception and the interpretation of the real. Seen from this perspective, the contribution of photography becomes significant. From the very beginning, Marois has made use of electronic media images, which he has manipulated by means of photocopying and various other pictorial strategies. The content of his images — of those dating from the 1970s and 1980s, at least — relates to animals and ways of life threatened with extinction: to beached whales and seals, caribou herds and hydroelectric dams in the far north. The artist’s references to photography faithfully echo the process of appearance and disappearance, while the gradual dissolution of his images extend the metaphor of a world verging on extinction. Various formal procedures apart from photography have also performed the role of erasure. They produced the irregular shapes of Marois’ early quasi-sculptural works with their partially open windows and their hideaway flaps. Examples of these would include Seal Hunt No. 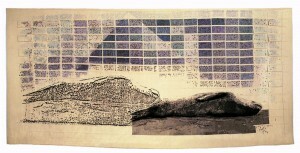 1 (1979); the grid-work relief structure that subdivides the composition and pushes the figures toward the edges in No Return (1979-1981) and in the imposing Seals in Metamorphoses (1982-1984); the manuscript- or altarpiece- shaped triptych Winter Sky: White, Grey, Blue (1982-1984), which conceals woven figures in its folds. Beginning in 1986, geometric forms began proliferating in a way that accentuated the role of framing. Excerpt from a Trajectory (1986) and Interrupted Passage (1986-1987) are good examples of this development. They constitute a real turning point and herald the abstractions to come. Fleeing animals are hampered by stretcher bars that serve to space, offset and even generate temporal and narrative fracturing. 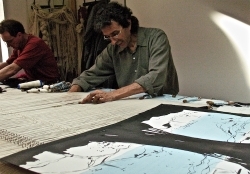 At the same time, Marois modified some of his techniques, using large-scale photographs instead of drawings as his working full size cartoon, and employing finer woolen thread in different values to make every stitch of the weft much more apparent. His shift away from press photography to photocopying and then to tapestry led to greater pixilation of the image and, consequently, to the alteration of his subjects. This period was also marked by the incorporation of woven texts. 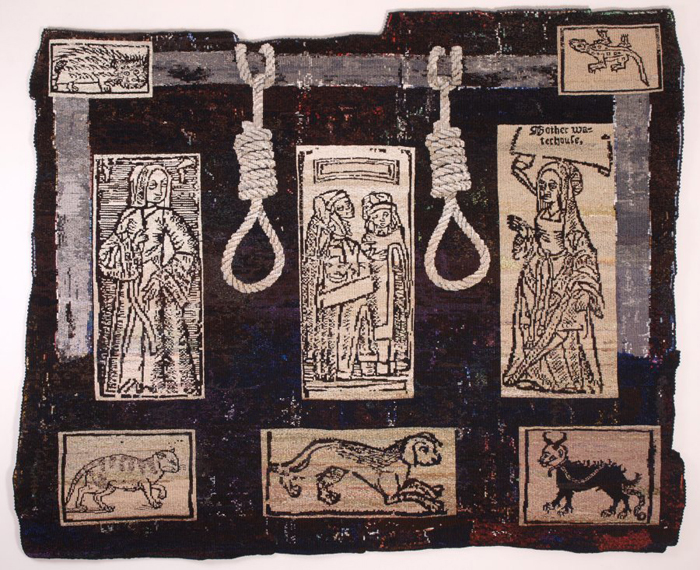 Words clipped from newspaper articles replaced the legends or other narratives inscribed in early tapestries. Texts, sometimes rambling and sometimes barely visible, defied legibility, providing no information on the nature of the events depicted. Snippets of scattered words filtered through a photocopy lens revealed the gap between the source of an event and its ultimate outcome, creating confusion and doubt with respect to the validity of the information received. The increasingly blurred subjects that followed would maintain this incertitude by a shift of emphasis away from the sensationalist events found in newspapers and toward the traces they leave. 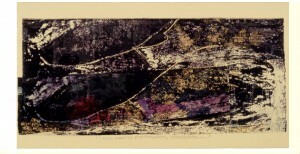 This was the case with Their Spirits Sank, into Disarray… (1988-1989) and Like One Breath in a Troubled Wave (1991-1993), which show agitated silhouettes in the coloured pigments and the grainy texture of the weft, prefiguring their imminent disappearance as they are apparently swept away by a flood. In Espace- Combustion (1994-1995), Mutation-Time: Green, Black, Turquoise (1996-1997), Burst-Light (1997) and the impressive Mirror- Swirl (1997-2000), the traces of an explosion, fire and cyclone strike as a sort of fiery blast, adding tension that complements the realism of the situations depicted. Atmosphere, then, determined the meaning of events that no longer existed as such. Or perhaps they never really did exist! This body of work has been described as a reflection on our beliefs with respect to the authenticity of images, beliefs that concern not only the rudiments of photographic truth but also the phenomenon of trivialization or loss that seems to have resulted from the excessive use of media images. One might consider, at this point, the mechanical reproduction techniques of Pop Art and the impact of Andy Warhol’s Death and Disaster series, whose express emphasis on (silk) screen effects exposed the “rhetorical artifices” of press photography.1 The comparison is useful to the extent that it reveals Marois’ critical stance with regard to the depiction of tragedy, the scope of current events and their instant recording. Dramatization and immediacy, as manifestations of forgetfulness, have led to a complete loss of bearings with respect to history and radically transformed our apprehension of the world. Apart from these riffs on the artifices of representation, the real critical scope of Marois’ works stems from their deconstructive power and their attempt to weave an entirely new history, a new dialectical surface made up of temporal, formal and material shocks.2 For the relationship between past, present and future is precisely where the “phrasing of history” (Jacques Rancière) appears and disappears.3 The relationship between media — photography, drawing, tapestry, painting — also makes it possible to talk about shock surfaces. This new history, constituted by a formidable telescoping of spaces and times, is constructed stitch by stitch in the long and methodical work of high-warp tapestry weaving. This slow-paced work is not only at odds with the brief time of the photo shoot; it also provides a critical counterweight to the immediacy of the information media, which these works of Marois implicitly denounce. And across this dialectical surface where all historical planes (the history of our time, art history, the history of disciplines) collide, “there is no ‘line of progress,’ only omnidirectional series, bifurcating rhizomes,”4 in the words of Georges Didi-Huberman. In Marois’ tapestries, the sediments of history are brought up to the same frontal plane on which — in a wink to both modernism and postmodern hybridization — all historical continuity flattens out. What we are dealing with here is not history set in stone (the splitting of planes notwithstanding) but narratives and images set in motion by the force of metamorphoses and undergoing continual transformation. This is yet another meaning that can be attributed to those restless and indeterminate surfaces of Marois’ that are the outgrowths of catastrophe. To give vision and memory time to reconstruct themselves, to fill in the gaps of memory, we must deconstruct or, as Jaques Rancière says, “disfigure,”5 the better to lose ourselves in the imagination. It is hardly surprising, therefore, that the works dating from 1996 to the present display a pronounced tendency toward abstraction. I am thinking here of the series of seven Rain which — Rain: Black and Yellow (1998), Rain: Yellow and Green (2000), Rain: Blue (2000) — and the Scenes series (2001-2003). Smaller, square-shaped works that reproduce and encapsulate the frame from within (as in the earlier Mutation-Time), and that accentuate their own geometric, minimalist and self-referential properties, revive the formalist stance to which the artist has remained faithful. In the Rain series, however, the sparkling effect produced in their central window by the vibration of vertical stripes, and the presence of striking colours that seem to have found the light again, are precisely what grab and hold our attention. It is difficult to pick out, from the succession of serried stripes, the fragments of forest that were taken initially from landscape photographs because they were substantially altered by a sort of electronic scanning. We are more inclined to listen for the whisper of the rain or the rustling of the leaves. 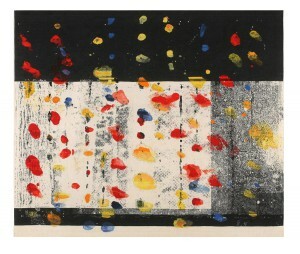 And in the Scene pieces, the watercolour splashes that look as if they were dropped onto the surface (Scene No. 2) add to the feeling of impermanence of the composition. The more sensory and lyrical bent of the works from this period would set the tone for those that followed. The conceptual and technical approach espoused by the artist over the past 15 years stems from a renewed experience of tapestry that runs the gauntlet between the opaque and the translucent, the material and the immaterial. Chromatic Downpour (2003-2008), Double Horizon (2003-2010) and Wind Territory (2010-2014) are more markedly gestural, with sprinkles and other decidedly fluid motifs that seem to trickle between the grains of the weave. The references to painting are unmistakable —closer, this time, to the abstract expressionism of a Frankenthaler or a Still — and are somewhat reminiscent of the watercolours on paper that Marois makes in conjunction with his practice of tapestry. The complicity between these two modes of creation breathes new life into the tapestries and attests to an unfailingly remarkable level of artistry, while the technique of weaving works against anything remotely gestural. 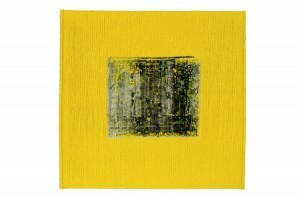 By transposing the spontaneity of the original studies that served as his models, Marois recreates a sort of trompe-l’œil in which woven and painted surfaces blend in ways that reflect the viewer’s distance from the tapestry and, behind the illusionist framework, call for a new apprehension of his work. Although luminous, airy space has replaced the forest motif and the more tragic events of Marois’ earlier figurative works, his initial social concerns have remained the same. They express the histories of our time, the slow alteration of the world and the phenomenon of forgetfulness from which they proceed. They invite us to consider the future and do so by going against the grain of time, by attempting to give shape to absence, to reminiscences and the world of the imagination, by reconsidering, stitch by stitch, our own perceptions of the world. Vincent Lavoie, L’instant-monument: Du fait divers à l’humanitaire (Montreal: Dazibao, centre de photographies actuelles, 2001), p. 137. This is an in-depth study on the modes of representation of current events. 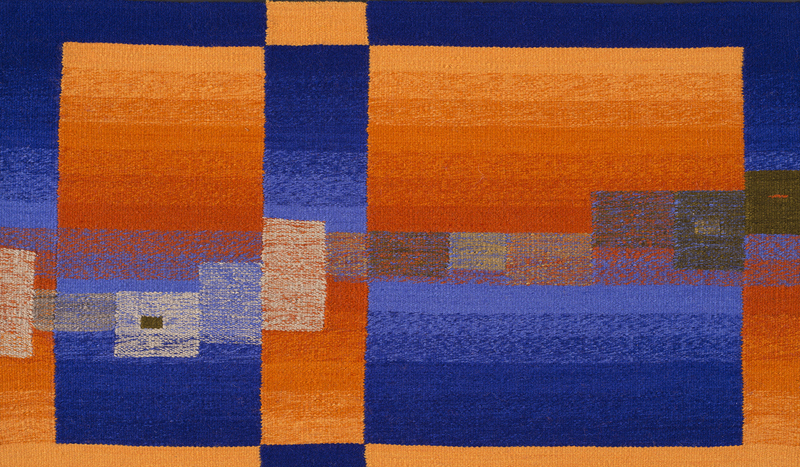 Janis Jefferies has done a careful study of the various time spaces, including the narrative time of tapestry, in the work of Marcel Marois. 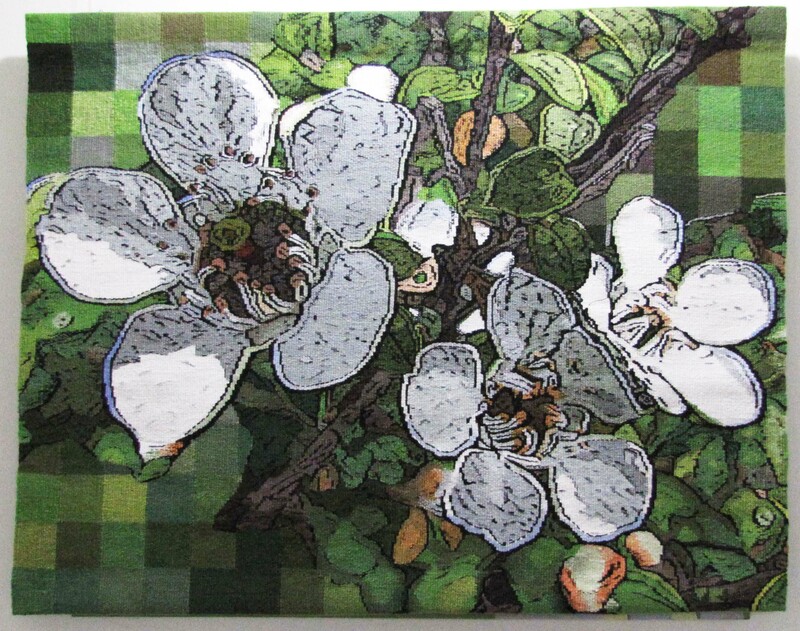 See Janis Jefferies, “Woven Time,” in Marcel Marois, exhib. cat. (Saint-Hyacinthe: Expression, centre d’exposition de Saint-Hyacinthe, 1994). Jacques Rancière, The Future of the Image, Gregory Elliott trans. (London: Verso, 2009), p. 62. Georges Didi-Huberman, Devant le temps. Histoire de l’art et anachronisme des images, Paris, Minuit, coll. « Critique », 2000, p. 102. [Free translation]. The author has written extensively on the concept of heterogeneous times in the apprehension of history. In Rancière, the word disfiguration refers to a doubling of the painting’s surface so that a second surface appears under the first. See The Future of the Image, p. 69.